these little gems were a lovely surprise this week. i was skeptical, them coming – randomly – from the disney family website (i have NO earthly clue how i originally got this recipe, although i think the link was sent to me by a family member). i had read through the ingredients and the instructions and they sounded delicious. and they were. divine. they have all the flavors of a chinese dumpling and the sauce is heavenly. 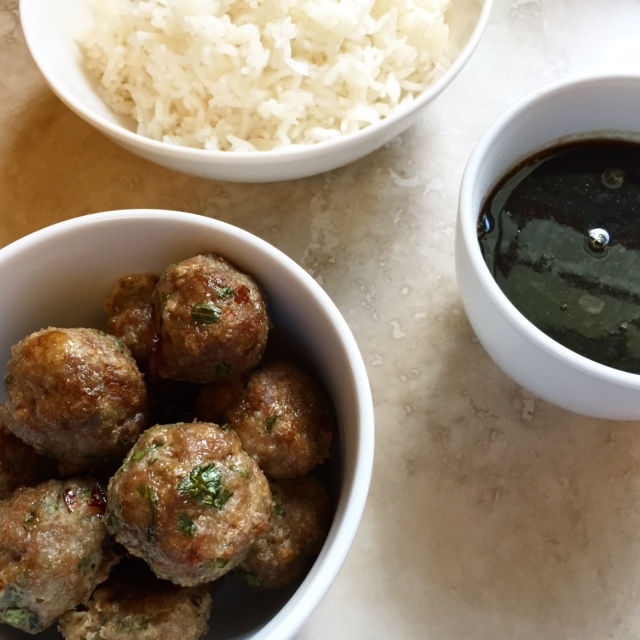 the meatballs are served best over jasmine rice and a side of the sauce. it’s an easy meal and delightfully yummy. also, the meatballs and the sauce save pretty well for a few days and are great reheated. oh and kiddos LOVE them. (both of the little shes are in a dipping phase right now – i know you mommies know what i’m talking about – so this was a HIT in the highchair this week.) these also freeze quite well, so they are a good option for make-ahead meals. 2. in a large bowl, mix together turkey, scallions, cilantro, oils, soy sauce, breadcrumbs, egg, and ricotta with your hands, then form meatballs by rolling 2 tablespoon-sized scoops between your palms. 3. arrange on a baking sheet covered with cooking spray or lined with parchment paper and bake for about 25 minutes, until browned on top and cooked through. 4. while the meatballs are in the oven, make the dipping sauce: in a small saucepan, stir the sauce ingredients together over medium low heat until the sugar has dissolved. simmer 3-5 minutes, stirring frequently, until the sauce thickens a bit. 5. serve with jasmine rice + dipping sauce on the side. **to make this recipe whole 30 friendly, make the following substitutions for the meatballs: sub coconut aminos for the soy sauce, replace panko breadcrumbs with guiltless superfoods’ 7 seed flour or raw almond flour, omit the ricotta cheese. then for the dipping sauce: sub pure date syrup (this one is my favorite and there is no added sugar) instead of brown sugar (using 5-6 tbsp), and again subbing coconut aminos for the soy sauce. and don’t forget to skip the jasmine rice if you’re on whole30!